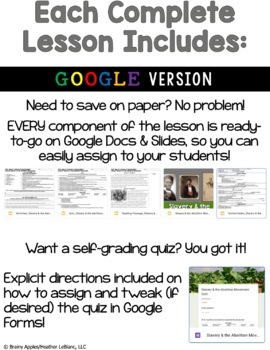 This resource pack is a no prep complete lesson (GOOGLE version included!) 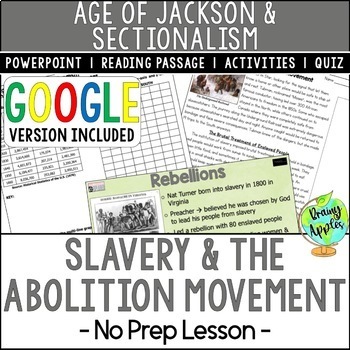 about slavery & the abolition movement of the 19th century that includes 3-5 days of materials. I will be adding an audio of the passage soon! 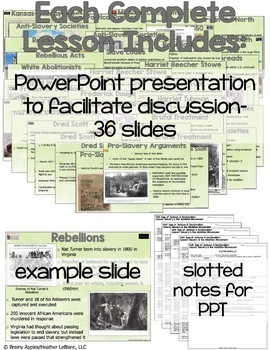 Includes: slavery in the North & South; expansion of slavery; the Missouri Compromise; the Compromise of 1850; the Fugitive Slave Law; the Kansas-Nebraska Act; slave codes; Anti-Slavery political parties & societies; rebellions & uprisings (Denmark Vesey, Nat Turner, "day-to-day" resistance); Harriet Beecher Stowe & Uncle Tom's Cabin; David Walker; Frederick Douglass; Sojourner Truth; Harriet Tubman & the Underground Railroad; the brutal treatment of people who were enslaved; treatment of free African Americans in the South & North; & the Dred Scott v. Sandford Supreme Court case. 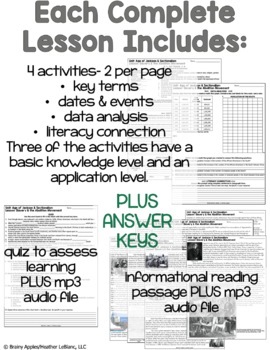 • 2 worksheet pages with 4 activities (key terms, dates & events, data analysis, and a literacy connection) Each activity has two levels: a basic recall and an application of knowledge.